Congratulations to Laura Turner for her publication in The Stamper's Sampler, Spring 2013 issue! 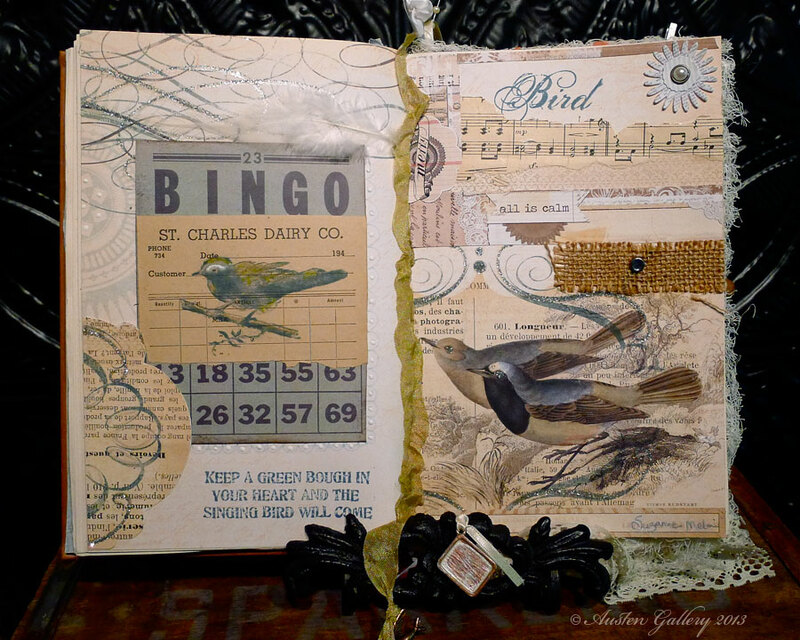 Laura had a three page spread devoted to her gorgeous shaker cards and circus themed art. Laura used both the Vintage Circus and Big Top Collections from Oxford Impressions to create her stunning circus masterpieces. I belong to an Altered Book Group that meets once an month. I love "book club night"! There are just over a dozen ladies who meet to share fun, food, and book art. Each member starts a book at the beginning of the year, choosing a theme. We pass the books from member to member; each month working on another topic. I am a life long book lover. Until a few years ago, I would have been appalled to cut into a book. My outlook has changed over the years. Books are a delivery system for the content. As I grow older, I recognize that not all content is sacred. Some books are beautiful, but not all. When I choose a book to alter, I am careful to select a book that is not valuable or rare. The book I worked on this month had a very general Spring theme. Spring means birds and nests to me and I started with that basic idea. I have been hoarding some scrapbook paper with large, gorgeous birds. I cut the paper to fit the pages as a start. I dyed some ribbon to coordinate with the colors, attached it and then stepped back to think. My first stamping to the page was a mistake. The green I used for a large fern frond did not match my applied ribbon. To hide the stamping, I tore some vintage sheet music and glued it to the page. I loved the look so much that I began patch-working with papers and fabrics. In the end, I used only a few stamps but I love the colors and textures of the finished project. The rubber stamped bird, word and phrase are from "The Bird's Nest" by Oxford Impressions.